*Annual BC Egg production and consumption. 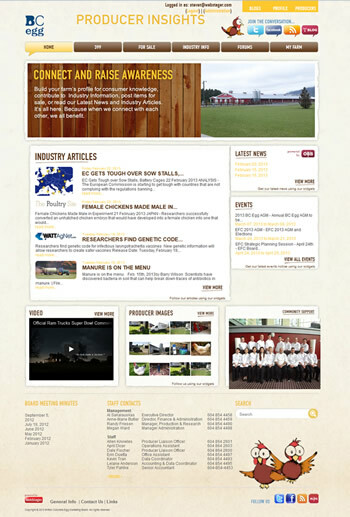 BC Egg has been a multi project exercise combining innovation, creative, social networking, SEO and ongoing promotion. Imagine harnessing a team of experts across the organization for content, expertise and knowledge with a central publishing dash board to approve edit, improve and shcedule publishing. A private social network empowering BC Producers to share and exchange news, articles and industry knowledge plus secure gateway into an innovative real time financial system created by IBM and featured in their Smart Planet – BC Egg web case study series. *all content held in admin staging are for edits and approval. Private Social Network and Portal Into Financial Portal Created By IBM & Featured - Smart Planet BC Egg. 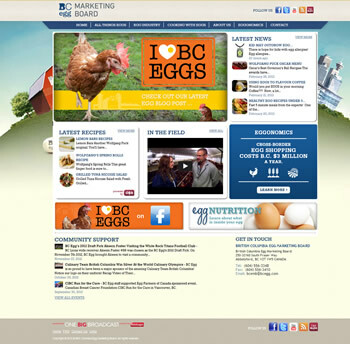 A socially integrated informative web platform packed with information about BC Egg and the egg industry reaching out on a consumer level while multiple guest and team blogging tools automate social news delivery and power up SEO. Side projects include community involvement with activities like social casting at events such the Vancouver International Marathon and the creation of brand awareness raising videos with the sponsorship of the BC Lions. 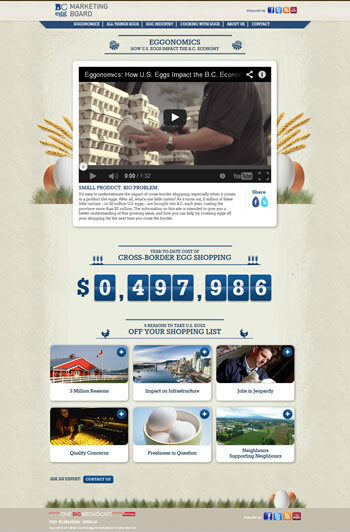 DDB one of the planet’s largest and innovative ad agencies are the BC Egg Marketing Board’s ad agency of record. DDB created a unique and disruptive ‘hands on’ ad campaign involving building a life size fire truck in downtown Vancouver combined with a media and awareness campaigns around cross boarder shopping and eggs. OneBigBroadcast used our all in one content creation and marketing engine to integrate DDB creative and monitor web statistics. Overall the campaign’s YouTube video received over 400,000 views within a 60 day period. Built money build up generation 'clock' for BC Egg and Eggonomics length of campaign.